Ethical, original, sustainable and with all the beauty and style that happens when Italians do something extremely well, Davines has become a Cult classic for countless discerning beauty lovers. For tresses in distress, this reinvigorating (stylishly packaged) mask gives back energy, volume and hydration to the hair and scalp – perfect after flights, nights out or exposure to extreme weather conditions. Enriched with detoxifying purple clay and rebalancing rhodiola extract, this leaves hair full of life and richly conditioned. Incredibly reinvigorating, Davines’ miraculous mask restores energy, volume and hydration to the hair and scalp, waking it up after stressful situations (flights, nights out) or exposure to extreme weather conditions (heat, cold and UV rays). The clever formula is enriched with powerful natural ingredients to restore life to lacklustre locks, including detoxifying purple clay and rebalancing rhodiola extract to ward against stress and damage. 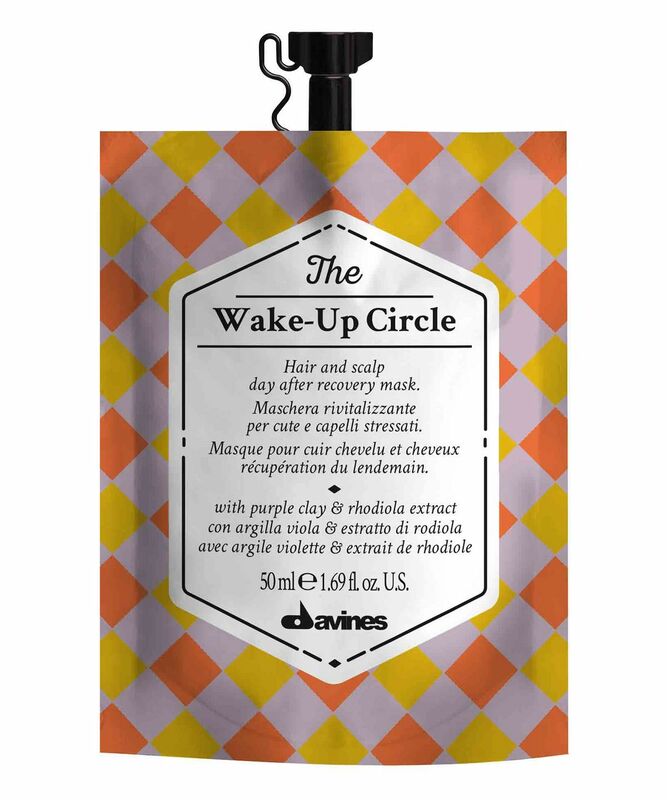 Highly conditioning as well as revitalising, Davines’ The Wake-Up Circle can be used either on scalp or lengths and ends and is perfect united with another of the brand’s treatments for a multi-masking effect. Apply to towel-dried scalp and hair after shampooing. Process for 10 minutes, comb through and rinse. Proceed with blow-drying. Mode 1 Lengths and ends: apply The Wake-Up Circle to revitalize. Lengths and Ends: apply The Renaissance Circle or The Spotlight Circle to repair or give your hair an extra shine. Scalp: apply The Wake-Up Circle to revitalize. Stayed on my hair for two washes, too heavy for my type of hair ( bleached fine hair - damaged) Not recommended. It smells very fresh (a bit minty) and leaves my hair smooth and untangled but crucially not at all greasy. My hair tends towards being oily, and a deep conditioning treatment is a treat, but usually leaves me needing to wash it the next day. This stuff leaves it full, bouncy, smooth and well conditioned without weight. Love it. This is really good. Like really good. I was in the US for two weeks and I don’t do conditioner and especially don’t do hotel room conditioner. The water was sooooo hard and my hair would have looked like a broom if i didn’t have this product with me. Bonus points because it’s an Italian brand and I like the packaging.